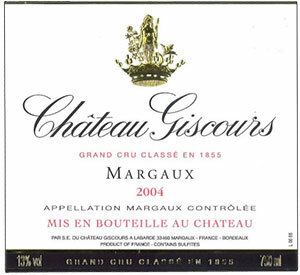 Probably the finest Giscours made since the 1975, this black/purple-colored 2000 offers up terrific notes of camphor, creosote, blackberry, and cassis jam intermixed with notions of smoke and earth. Spicy, with low acidity, a big, rich, fleshy, full-bodied palate, outstanding texture, and a long, pure finish, it is, to reiterate, one of the best Giscours produced over the last 25 years. A sleeper of the vintage, it is still available for a realistic price. Tasted at the Château Giscours vertical, the 2000 Château Giscours is a blend of 55% Cabernet Sauvignon, 40% Merlot and 5% Cabernet Franc picked between September 25 and October 7. The bouquet is clearly in a different league to the previous two vintages: red plum, mulberry and cedar aromas that generously waft from the glass. There is something a little more exotic about these aromatics, with hints of stewed apricots in the background. The palate is medium-bodied with fine tannin and cedar-infused black fruit with hints of black truffle towards the finish. Perhaps I was a little over-enthusiastic when I last tasted this millennial Margaux, and it seems to lose energy observing it over a ten-minute period, hence my docking a couple of points. Tasted June 2015.